If you are preparing for a job interview, or perhaps even a blind date, you might want to know what your background check would reveal if one is performed on you! It is mostly common knowledge that any standard background check will reveal a felony conviction or criminal charge. However, people question whether or not less serious convictions, such as misdemeanors, are reported on background scans. A misdemeanor conviction is less serious than a felony, however, it is still a criminal conviction nonetheless. This means you are considered a past offender, or criminal, as a result of the misdemeanor conviction. For this reason, you can almost guarantee that your misdemeanor will appear on your background check. Continue reading to learn more. There are several types of misdemeanor crimes, with the most common being petty theft, drug possession, intoxicated driving, public intoxication, disorderly or lewd conduct, and vandalism. These convictions usually come with minor to moderate legal penalties that are mandatory, including jail time, probation, routine drug testing, fines, suspended drivers’ license, community service, drug and alcohol education, rehabilitation, house arrest, and more. The consequences of a misdemeanor conviction are much less severe than those of a felony conviction, however, misdemeanors and felonies do have one thing in common: they stay on your criminal record for life. So if a person runs a background check on you, they are likely to receive information about any criminal convictions you have on your record, misdemeanors or felonies. However, some background check systems are not as thorough, so it may not show up at all depending on the level of scan they perform. For instance, because most misdemeanors are prosecuted at county levels, a person running a state background will only find misdemeanors committed in the same state or county. If you have a misdemeanor on your criminal record in another state, it might not show up on a background report. On the other hand, if they were to run a federal level background check, or a more comprehensive check, they may be able to find your misdemeanor conviction or charge. It is important to always assume that your criminal records will appear on all background checks. Fortunately, in Indiana, there is a new law that allows past offenders to seal their public criminal records if they qualify. And misdemeanors are easier to seal so long as a person meets all other qualifications! In order to expunge a misdemeanor, you must file your petition properly. One mistake, even a tiny spelling error, can erase your opportunity for the rest of your life. 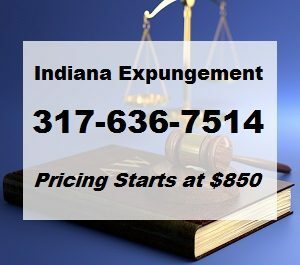 For this reason, you need a professional Indianapolis expungement lawyer to help you file your application and meet all your state requirements and deadlines. Call 317-636-7514 if you would like to petition for restricted access or expunge an arrest from your criminal record in Indianapolis. We are happy to provide free initial consultations to discuss your case without any out-of-pocket obligations. And our rates start as low as $850! This entry was posted in Criminal Record Sealing and tagged Indianapolis Expungement Lawyer, Misdemeanor background checks, restricted access criminal records, sealing criminal records, what shows on background checks. Bookmark the permalink.